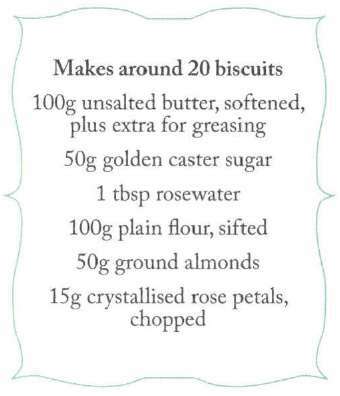 These delicate biscuits, laced with rosewater and studded with crystallised rose petals, are as fragrant as a summer’s day. Cream the butter, sugar and rosewater in a large bowl. 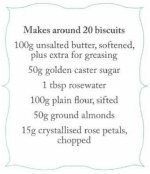 Add the flour, ground almonds and rose petals and mix everything together to form a dough. Take heaped teaspoons of the mixture and roll it into balls. Flatten them slightly on the baking tray. Bake in the oven for 15-20 minutes until just golden. Leave to cool on the baking tray and store in an airtight tin for up to three days.